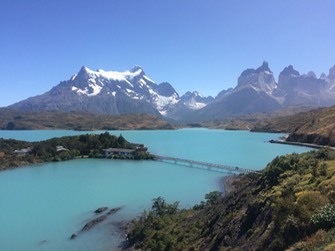 Chile has been on our list of places to go for a long time and it didn't disappoint. The time of year that we were here prevented any southern travel so that will have to wait. 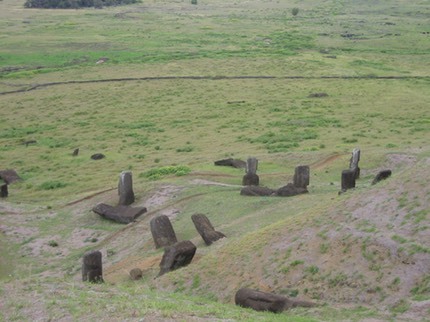 Easter Island is one of those must see places and proved to be fantastic, albeit expensive. We moved north relatively slowly picking a few places to spend a few days in. Famous for its carved stone moais Easter Island is stunning. Miles from anywhere, yet populated by great stone carvers. 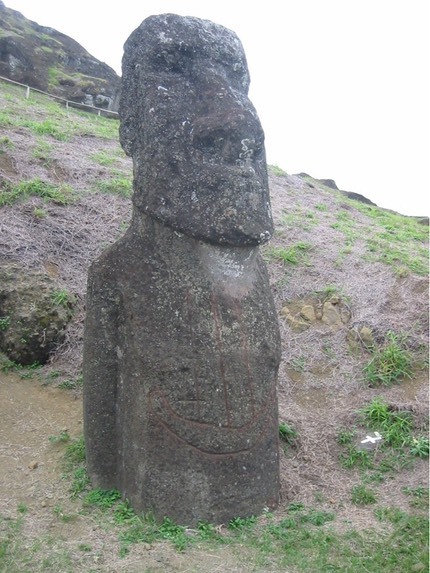 There are about 800 of these statues on the island many of which are still in the quarry in various states of completion. The ones in the second picture here are finished and were on their way to their coastal locations when whatever stopped the building happened. Each statue is finished off with a red top knot carved in a different quarry. From Santiago we headed north to stay on a hacienda deep in the Andes near the Argentine border. It was a beautiful location and we were able to walk and ride everyday. Bliss and a perfect place to retire to. Apart from 2 nice German girls the other guests were a group of Canadian bible bashers holding an away day on how to 'plant churches' in Chile. It was horrifying to hear them plot and connive. Missionaries are still very much alive. They also had a guitar with them and sang all day about the beauty of God's nature whilst not actually going out to see any of it. 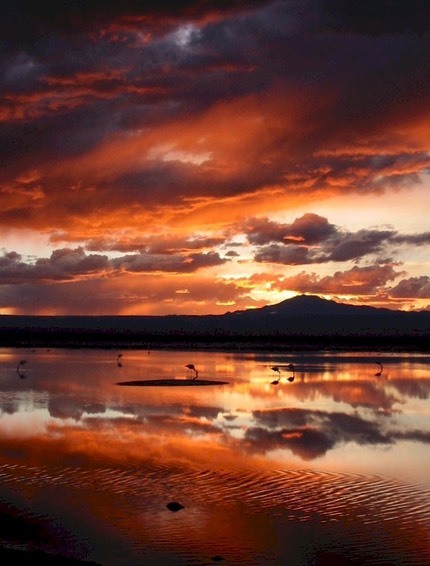 Further north is San Pedro de Atacama the centre of trips to the surrounding salt flats. 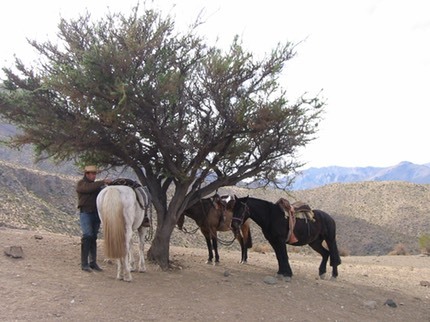 Its a real two horse town but has great bars, restaurants and tour offices, to cater for travellers who all come here when in Chile. This sunset was fantastic and if you look carefully you can see the flamingos that live in these inhospitable conditions. Whilst we were here there were freak weather conditions. We endured 5 hours of rain in the driest place in the world, further confirming my reputation as a 'rain-bringer'. It was so unusual that all the schoolkids were given the day off to look. Additionally the border with Bolivia was closed for 3 days by snow leading to a build-up of travellers in town. We finally left San Pedro and carried on up to Arica near the Peruvian border where we visited the Lauca National Park for 2 days with a Dutch couple we met. 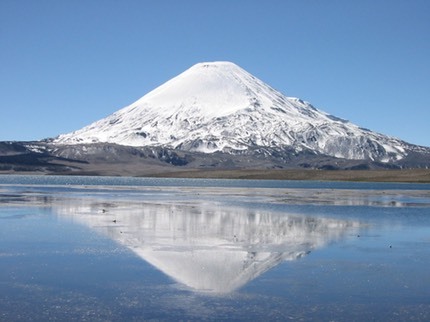 The volcanoes here are fabulous as you can see and there is also a lot of wildlife. Vicunas which are little llamas and Vizcachas which are fat relatives of rabbits. It was all over too soon and we had to head to Peru to meet Rob and Helen. 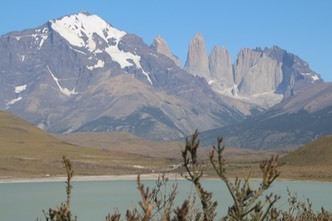 Having seen north Chile on the previous trip this time we focussed on the Lake District and Tierra del Fuego. Having flown in from Cuba we caught a bus to Temuco and picked up our rental car. 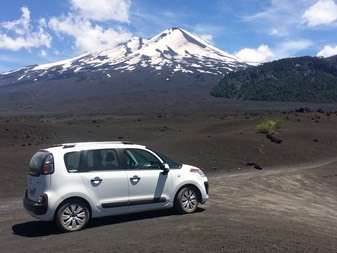 In hindsight we should have gone for a 4x4 but we didn’t so had a few problems in some parks in our trusty little Citroen. It spent a lot of time offroad and covered a lot of miles but unbelievably when I returned it, the guy declared it good after a cursury glance. Phew, no charges. The Lake District area of Chile is stunning with vast parks full of monkey puzzle and antarctic beech trees. 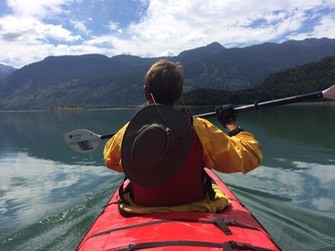 Some good, well-marked walking trails exist and we also managed to get some kayaking in (again). Not having a four-wheel drive restricted some of the places we could get to. We stayed in a variety of places and if I have one criticism of Chile it concerns booking hotels through apps. After booking, many contact you with requests to call them, or make bank transfers, not easy with language and travelling restrictions. Other than that, great country. 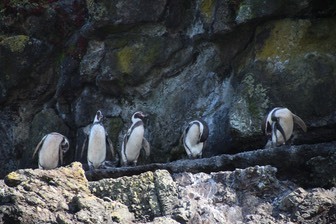 The last section of this trip was on the ferry to Chiloe Island and a nice boat trip to penguin colonies. Chile is very laid back compared to the rest of Chile, and has some nice walking in it’s national parks. One word of warning for the whole of the lake district is the horseflies ( called tabanos locally) that are present for a 2-4 week period at peak visiting time. They ruin most outdoor activities, are called red-tailed bastards by the locals and are numerous, vicious and persistent. After the Falklands we returned to Chile for a week in Tierre del Fuago, which is undoubtedly the most beautiful scenery in the world. Time was split between Punta Arenas and Puerto Natales. Punta Arenas has a nice national park closeby with marked trails and also has over 100 strip clubs. Puerto Natales is the access point for Tierro del Fuego, and we shoudl have spent longer there. The actual park is still a long way from PN and access needs to be planned well in advance. We suffered from a booked tour not turning up for us, which kind of ruined our plans. This picture below is a hotel on an island in a glacial lake. What a view. Too expensive for us to stay at, but nice all the same.